The model of the blockchain-powered ride-sharing platform will combine several aspects of the existing models but the company will eventually entirely owned by the actual drivers. The International Monetary Fund (IMF) is an organization of 189 countries, working to foster global monetary cooperation, secure financial stability, facilitate international trade, promote high employment and sustainable economic growth, and reduce poverty around the world. To the casual observer the IMF has directed its attention mostly towards monetary concerns. Therefore it is unsurprising that the IMF weight into the discussion on virtual currencies (VCs) and the underlying distributed ledger systems. The quality of the answers you get are usually correlated with the quality of the questions you ask. In case of the International Monetary Fund’s ‘Staff Discussion Note’s on Virtual Currency’, the questions are being asked inside of a very narrow and very dark cardboard box with a peep-hole directed to the past one hundred years. When analysing the function of virtual currencies as money, the IMF paper simply declares it as falling short of the legal definition of money (page 15) and cites the usual definition of money including recent historic background. Innovators in the cryptocurrency space must feel like Henry Ford when being told that his car was falling short of being a horse. Category: cryptocurrency, Search | Comments Off on International Manipulation Fund? Recent disclosures by members of Ukraine’s legislature revealed that three lawmakers have a combined wealth in bitcoin of almost $50 million. According to a report from RIA Novosti, Russia’s international news service, the three lawmakers are all members of the “Petro Poroshenko Block,” which constitutes the largest group of legislators within the Parliament. Of the three named by the report, Dmitry Golubov possesses the most bitcoin: 8,752 BTC, an amount worth roughly $37 million at current prices. Alexander Urbansky possesses 2,494 BTC while Dmitry Belotserkovets owns 398 BTC, worth approximately $10 million and $1.6 million, respectively.Two bills to provide legal frameworks for cryptocurrencies including Bitcoin have now been submitted to the Ukrainian parliament. The latest one proposes recognizing them as financial assets. It also defines cryptocurrency derivatives, market of cryptocurrencies and their derivatives in Ukraine,” Bill No. 7183-1 was submitted last week. 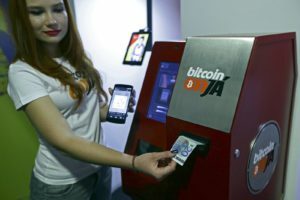 And, other report confirmed that 150 Bitcoin machines will be installed in Ukraine later this year.